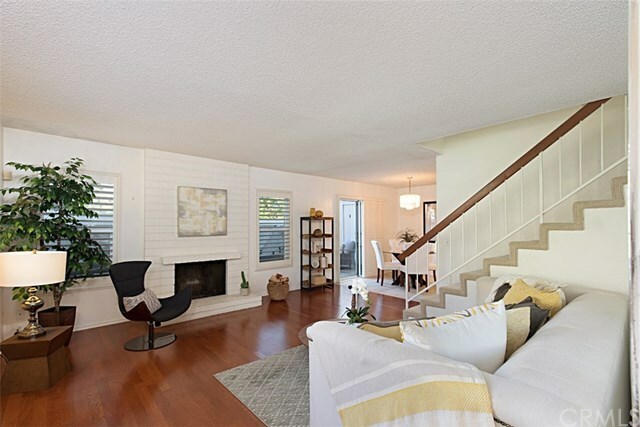 Amazing 3 bedroom, 2.5 bath end-unit townhouse in Monarch Beach in a quiet community just 1 MILE from Salt Creek Beach! Tons of natural light and newer double pane windows. Downstairs youâll find a warm, inviting family room with a fireplace and dining space, kitchen, powder bath, and very large private patio area, perfect for entertaining. Large 2-car attached garage with plenty of cabinet space. Kitchen was remodeled in 2015 with brand new appliances, quartz counter-tops, re-covered soft-close cabinets with slide outs, and recessed lighting. Make your way upstairs to find the large master bedroom and huge master bath with two sinks, tons of counter space, walk-in shower and tub. Also upstairs you have the large second and third bedrooms and shared bathroom. Home comes with Central A/C, water heater replaced in 2014, new windows in 2013, and a central vacuum system. All appliances stay including all kitchen appliances, and washer and dryer. Nice-sized side yard feels like your personal yard for some added privacy and greenspace. This nice, quiet community also offers a clubhouse with pool and spa for your enjoyment. Trash and Water included in HOA dues. Enjoy great walks on the nearby Aliso Summit Trail, or walk along the Monarch Beach Golf Course to the world-class Salt Creek Beach! Directions: Take Pacific Island Dr. from Crown Valley and make your first left on Highcrest. Home is first one on the left in the community.